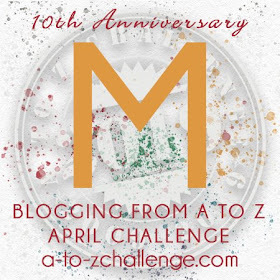 We're celebrating our Tenth Anniversary here at the April Blogging from A to Z Challenge. #AtoZchallenge. The blog hop that made an online community by asking bloggers to spend the month of April using the English alphabet as inspiration for their posts. We're glad you stopped by today. You've reached the midway point! In my neck of the woods, there's a place called the Midway Diner (it's between Harrisburg and Allentown, Pennsylvania, USA). Reward yourself. 💍💍💍💍💍 Five golden rings perhaps? Reply to any comments people left you. Comment on Thirteen more posts because of M.
Think about your reflection post next month. That's the link to the Master List. You can find, and hop to, all the blogs officially participating on that sheet. 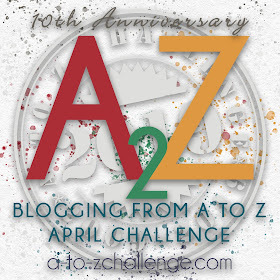 Here's my thank you to the fabulous host and co-hosts of the A to Z blogging challenge. My favorite mid-day food is chocolate chips, hold the cookie. It also works as a reward, so perfect. Now it's time to go visit 23 more blogs, gotta go. My favorite midday food is not something I can leave a cooment with, so I'm just commenting with my daughter's computer. I hope that's going to be okay. Midday, midway, pick-me-up, feel-good, anytime food's got to be chocolate. Thank you guys hosting and co-hosting the AtoZ Challenge! I'm up to reply to every comment I received today, visiting back their blog of course, and discovering new to me AtoZChallengers! Let's go for the second part of the fun!! Mmmmmm My favorite part of lunch every work day is my dessert: Greek yogurt topped with my own homemade jam. Oh hey, I know that diner! I currently live in Allentown, and I occasionally have to make the drive to Harrisburg. Anyway, I'm definitely feeling good about reaching the midway point. We're halfway through the Challenge, and the end is in sight. Very exciting! Attempted a monologue, something which I could post in both the forums. A to Z and NaPoWriMo.A first time attempt at this form. So far, so good! Doing extra comments today...because I can! Hmmm - 10 posts; mid-day snack of grapes and cheese; 13 posts; don't give up! Mmmmmmm am I half full or half empty . . . 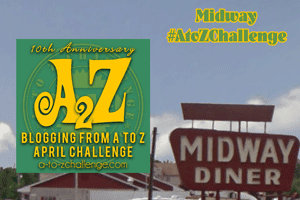 Thanks for hosting the A2Z Challenge. My journey so far has be wonderful and awesome! Looking forward to the other interesting days! Thank you to the co hosts for hosting this challenge. Mid way and midday - my midday meal was school lunch (I'm a teacher) and was Rice and dal, yogurt and a huge bowl of salad. Dessert was chocolate cake - yum. Where would we be without the awesome A to Z team? In the ocean without a sail - or a bilge-pump. Midday snack is breakfast most days - coffee comes first.